Merchandise theft. Property damage. Employee tampering. Organized crime. Manufacturers sustain losses valued in the billions of dollars each year – incidents that often are perpetrated by employees or involve internal collusion. Citiguard has solid experience addressing security threats in manufacturing environments. We deliver customized security solutions designed to expose security breaches, reduce theft and shipping loss, minimize employee collaboration, and sustain profitability. In short, we offer the most reliable, comprehensive and professional logistics support available. Citiguard can work with your loss prevention management to conduct logistics and manufacturing security audits that identify threats to your facility, both internal and external. 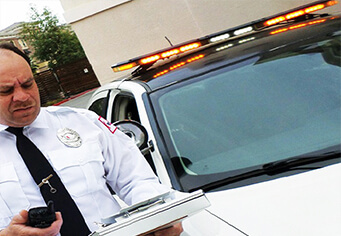 Our security officers, supervisors and managers are trained in logistics security. Customized training programs provide a clear understanding of the security requirements of logistics operations, and we can supplement our training to address your site-specific needs and procedures. Citiguard provides service skills and safety training for our employees, and welcome coordination and cross-participation with your staff training and quality assurance programs, as appropriate. We are committed to our employees and provide on-going professional development designed to enhance their capabilities and effectiveness. We offer a collaborative, proactive approach in reviewing command and control procedures, loss prevention control and access control. Post orders, officer duties and operating policies and procedures are aligned with your security management plan and internal policies. We understand logistics and manufacturing environments, and offer a variety of services that meet specific needs. • conducting surveys and assessments to assist in identifying overall security needs. • conducting investigations to identify theft, fraud, unethical business conduct and substance abuse. • implementing workplace violence prevention, food safety and security, emergency and disaster preparedness and hazardous materials programs. • improving the safety of your facility with fire protection, security and engineering design services that meet OSHA requirements. • implementing integrated electronic security systems, including burglar and fire alarms, CCTV, access control, traffic management systems, lighting systems, locking devices, monitoring and surveillance. • assessing Internet/intranet security needs and investigating computer crime and breaches. • processing and monitoring shipping and receiving controls, seal requirements and logistics documents. • providing executive protection and serving as liaison with law enforcement. • offering fire and life safety (including HAZMAT) services. • providing perimeter protection and facility security during workplace disruptions. Logistics and manufacturing facilities have become a huge target for criminals due to the fact that each manufacturing company can have millions and in some cases, billions of dollars in products and equipment that require protection at all times. There are a large number of employees at a manufacturing facility and they have a lot of valuable property. Citiguard ensures you that you can entrust in us to keep you, your employees and your property safe. It is our job to ensure the manufacturing facility is protected from theft, vandalism, fire and terrorism at all times. Our experienced security guards use certain devices, such as CitiTrac, to monitor the patrol checks done on a single shift. This helps Citiguard and the plant manager to know the security guard’s routine and to make sure he/she is following all post orders. We utilize Closed-Circuit Television (CCTV) to monitor the activity going on in the facility and outside the facility at all times. Logistics and manufacturing companies are strong targets for getting their products or equipment stolen and/or their premises vandalized. Don’t let your facility be next. No matter how big or small the facility, it deserves to be protected. Security starts on the outside of the facility to prevent any trespassers, detecting suspicious and intrusion detection. For a smaller facility, we would use a foot patrol security guard and for a larger facility, we would provide a golf cart or even a marked patrol vehicle to our security guard. Citiguard is committed to the advancement of security in logistics and manufacturing environments. We have invested significant resources to provide security professionals who understand the specialized needs of your industry and perform to the highest standards. Contact Citiguard to set up your free consultation today to discuss protecting your premises with one of our knowledgeable security protection consultants.